Posted on 18, April 2016 by EuropaWire PR Editors | This entry was posted in Austria, Automotive, Environment, Germany, Technology and tagged 37th Vienna Motor Symposium, Continental, Rolf Brück, turbocharged gasoline engines. Bookmark the permalink. Vienna, Regensburg, Lohmar, 18-Apr-2016 — /EuropaWire/ — The international technology company Continental has chosen the 37th Vienna Motor Symposium to present an innovative emissions control solution for downsized turbocharged gasoline engines. The introduction of Real Driving Emissions legislation will require vehicles with this widely used engine concept to meet strict nitrogen oxide (NOx) limits in all driving situations. This poses a new challenge by demanding efficient NOx reduction across a very broad spectrum of engine operating conditions, and not “just” in the current test cycles. However, the existing close-coupled catalytic converters of today offer little margin for any further improvements in lambda distribution. On the US front meanwhile, the LEV III SULEV 30 standards stipulate a 70% reduction in fleet-average nitrogen oxide emissions by 2025. High-performance 3-way catalytic converters of today already achieve a NOxreduction rate of 99%. But that still doesn’t go far enough, and a further efficiency hike must be targeted. For downsized turbocharged gasoline engines, this presents two challenges. Firstly, cylinder-to-cylinder variations in exhaust gas composition mean that the fuel-to-air ratio (lambda value) can deviate from the ideal value, adversely affecting NOx conversion. The aim must be to avoid such cylinder influences on exhaust lambda, by flow mixing. However, this is difficult in the case of a close-coupled catalytic converter, because the down pipe to the catalytic converter is not long enough. This is why many new vehicles now feature a second – underfloor – catalyst to convert the remainder of the nitrogen oxide emissions, a solution which comes at the price of additional weight and increased exhaust back pressure. Secondly, in some operating situations, the catalytic converter’s ability to achieve a consistent and uniform NOx conversion rate can be adversely affected by the turbocharger system. This is because the opening of the turbine bypass valve (wastegate) above a certain engine speed affects the flow distribution, resulting in non-uniform exhaust flow. This can potentially lead to faster local ageing of the catalytic converter and to a deterioration in NOxreduction performance. The active section of the ring catalyst is wound from Continental’s innovative LS metal substrate. The longitudinal structures in this material generate micro-level turbulence in the exhaust stream, which helps to direct the nitrogen oxides more effectively towards the catalytically coated catalyst wall, where they are converted. 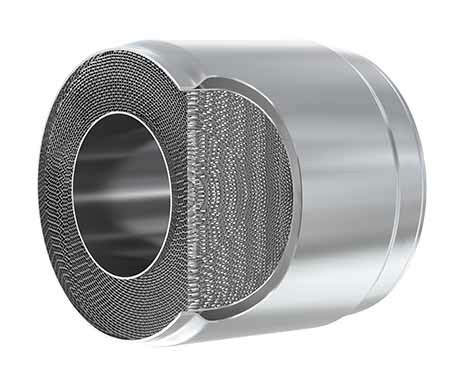 Close-coupled annular catalytic converter developed by Continental supports nearcomplete NOx conversion in turbocharged gasoline engines.